The International Monetary Fund (IMF) issued a new report yesterday projecting that debt as a share of GDP will decline over the next five years for all advanced economies except for one: the United States. 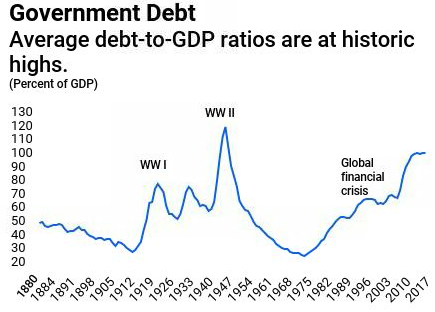 Across advanced economies, debt-to-GDP ratios have been rising persistently over the past 50 years, and are currently at levels not seen since World War II. The IMF warns that higher deficits and debt make countries more vulnerable to unexpected fiscal crises, reduce the amount of fiscal space governments have available to respond to economic downturns, and can crowd-out investments in the private economy. As the global economy has continued to recover from the financial crisis, several countries have begun to take the necessary measures to improve their finances and reduce their debts. As a result, debt will decline as a share of GDP in most developed countries over the next five years, so long as they follow through on their current plans. By contrast, the United States will see an increase in its debt to GDP ratio of nearly ten percentage points. As growth gains momentum in most countries, fiscal stimulus to support demand is no longer appropriate. At the same time, fiscal multipliers, which measure the short-term impact of changes in taxes or spending on output, are expected to be smaller. This implies that the benefits from short-term fiscal stimulus are limited, and the economic costs of reducing debt and deficits relatively smaller. Reducing debt and deficits now will diminish a country’s vulnerability to changing market sentiment. It will also ensure that policymakers have sufficient resources to act in case of a downturn—precisely when fiscal multipliers are larger . . .
[W]e urge policymakers to avoid fiscal policies that provide unnecessary stimulus when economic activity is already picking up. Instead, most advanced, emerging market, and low income developing countries should deliver on their fiscal plans, and put deficits and debt firmly on a downward path. 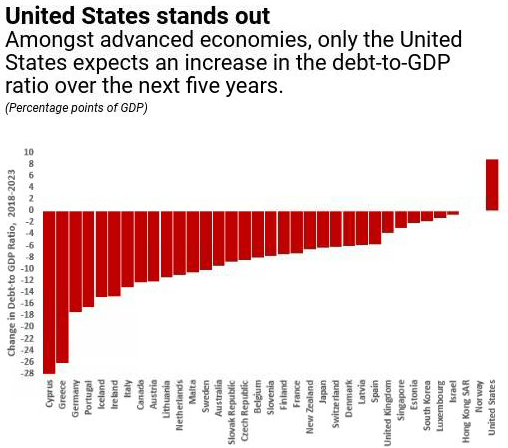 The United States is currently on track to approach record levels of debt. Policymakers would do well to follow the IMF's advice and use the current economic expansion to get debt and deficits on a more sustainable path, as such adjustments will be much harder when the economy slows down.